Shadowpeople ... cold spots ... orbs. 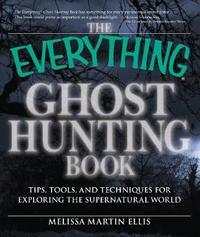 Ghosthunter Melissa Martin Ellis takes readers on an exciting high-tech journey into the supernatural world of haunted sites, restless souls, and messages from beyond the grave. Readers explore motion sensors, highly sensitive digital cameras, and so-called Ghost Telephones, as well as the supernatural phenomena themselves, including: Poltergeists Electronic-voice phenomena (EVP) Possession Photo anomalies Seances and voodoo rituals Appealing to the same audience as such popular TV shows as Lost, Medium, Invasion, Charmed, Ghost Hunters, Destination Truth, and Most Haunted, this book shows readers how today's investigators use the tools of modern science to study a wide range of paranormal activity. Melissa Martin Ellis (Newport, RI) is a member of the Rhode Island Paranormal Research Group and the American Association of Electronic Voice Phenomena. Her expertise with photography has dovetailed with her interest in the spirit world. She is the author of The Everything[registered] Guide to Writing Graphic Novels and The Everything[registered] Photography Book, 2nd Edition.